Wild oregano oil is made from Origanum vulgare, a perennial herb with small purple flowers and dark green leaves. It has a pungent flavor and is used in cooking to make pizza and other Mediterranean dishes. The essential oil has medicinal properties. The active ingredients thymol and carvacrol are potent antibacterial, antiseptic and antifungal agents. Sinusitis is a viral, bacterial or fungal infection of the sinus cavities around the nose. Sinusitis can also be a chronic condition, causing headaches and tooth pain. According to Balch and Balch, sinusitis is a good candidate for treatment with wild oregano oil. Visit a natural food store or food co-op that carries organic herbal remedies and purchase oil of oregano. Make sure the product you buy is organic, made from Origanum vulgare, and contains at least 50 percent carvacrol. 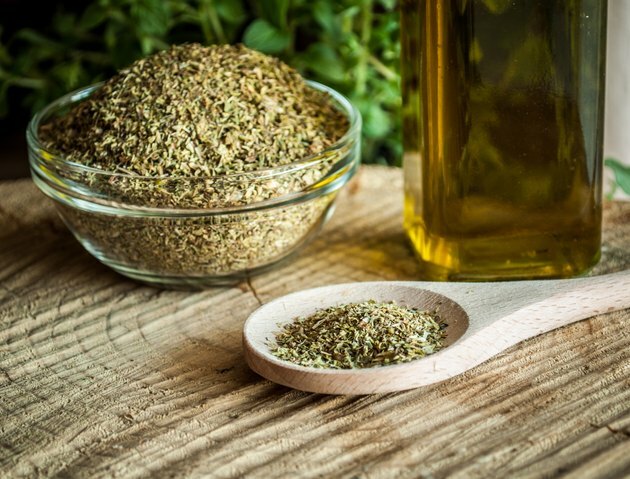 Check the label to make sure the oregano oil is diluted with an edible oil like olive oil. This is important because pure essential oils are too strong to be taken undiluted. Take the prescribed dose with meals. Generally the dose will be one to five drops of the liquid oil once or twice daily. Mix the liquid oil with juice or water. If you are taking capsules the dose will be one to four capsules daily. Always read the dosage instructions on the label since products vary in strength and carvacrol content. Monitor your improvement. You should see the infection improving within three to five days. Start taking wild oregano oil in small amounts: one to two drops of the liquid oil twice a day, or one to two capsules twice a day. Gradually build up to the higher dose indicated on the label. Take the oil for two weeks, then stop for two weeks. You can begin again if necessary. Be creative in finding foods to mix with the oil. Honey, syrup, milk and juice are a few of the popular foods used to mix with wild oregano oil. Eliminate wheat and dairy products from your diet until the sinusitis passes because these products increase mucus production. Always take wild oregano oil on a full stomach. The pure essential oil is a skin irritant. Never apply it to your skin without diluting it. Wild oregano contains alpha-thujone, oleanolic acid and beta-bisabolene, which are abortifacients. Do not use this oil if you are pregnant. If you experience an allergic reaction such as itching; swelling of the tongue, lips, or face; or difficulty breathing, discontinue the product and call your doctor. If you have diabetes, do not take wild oregano oil since it may lower your blood sugar level. Wild oregano oil may interact with and alter the effects of birth control pills, since it contains phytoestrogens (plant estrogens) such as apigenin and naringenin. Wild oregano oil may enhance the effects of anticoagulant medication. “Prescription for Nutritional Healing”; Phyllis Balch and James Balch; 2000.